See the Sons as you never have... Alone. The Sons of Anarchy are more than a club, more than a gang, more than an organization: they are a brotherhood. But what happens when your favorite Sons are on their own? In these four stand-alone stories, Jax confronts an ex-member of the club who opens old wounds...Juice's side business, Clear Passages, faces a blackmail plot which is more complex than it first appears...Bobby's trip to Vegas takes a wild, hungover turn for the worse...and Happy, long before he became a Son, gets his very first tattoo. These are the Sons as you've never seen them before: alone. 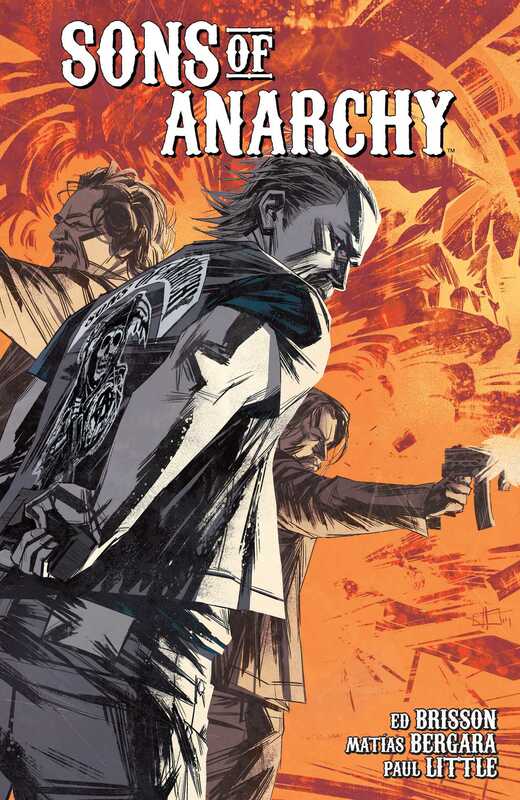 Written by the tremendously talented Ed Brisson (Sheltered, Cluster) and illustrated by the incredible Matías Bergara (American Vampire),Sons of Anarchy: Volume 4 is a wild ride through the private lives of the baddest men in Charming. Also featuring a cover gallery by Toni Infante (Sons of the Devil).